Departing from the week-to-week format is a list of ways to embrace spring for young minds, hands and spirit. Find a place where it is safe to walk barefoot on grass, dirt, or sand. We forget that the feet are incorporating sensory information, too. Did you know that toe-walking can be a sensory avoiding behavior? Remember, your child's sensory experiences are wiring his brain. Combining self-guided movement and senses integrates the the mind. Set up a kitchen outside- Your kitchen will need old pots and spoons, mud, dirt, sand, plants that can be picked, sticks, containers, milk crates, buckets, rocks a table, a water source and no adults interruptions. The only rule- hose off before you come inside. Build a fire outside and set clear, positive boundaries about being safe with fire. Cook foil packs in the fire, roast food on a stick and enjoy a dessert. Burn orange peels. Read the poem "Kneel Reverently When You Light A Fire" sing songs and play instruments around the fire. Tell stories. Look at stars. Name constellations and planets. Provide heavy objects like stumps to carry around or push in a wheel barrow. 2. Take a Hike: Hiking 101: Resist the impulse to guide, direct, or point things out. Let your child's own interest be the guide. When he points something out to you, reflect the joy you see him express. When he notices something, name it! Take a field guide with you or try to learn names yourself so that you can give specific names of the type of trees, flowers, insects, animals or rocks. Let your toddler guide you on a "hike" in the most natural woods you can easily access. Toddlers are not linear so your hike may look more like the the trail of a spinning top. Relish the opportunity to relinquish control. Let your preschooler guide you on a hike. A child can usually walk her age in miles if she can progress at her own pace. You'll notice your child won't complain when she's the leader. She's in charge. If she does complain, remind her, "It sounds like you're feeling uncomfortable. What would you like to do about that?" Before you declare her the leader of your hike you can set the ground rules: "We stay on the trail", "We can't pick flowers or leaves" (in a park), and "We know we're on the trail when you see the blue triangles," for example. Let your child know ahead of time that you'll let them know when it's "halfway time" to turn around and go back unless they want to turn around earlier. Find a perfect climbing tree and let your child climb and swing and hang on branches! Of course, we must assess safety. One of the most important ways you can help keep your child safe is to NOT HELP so that he can assess his own movements accurately. The goal is not that she doesn't fall. Falling is ok. It's just our job to make sure that falling is safe enough. Scrapes heal, a spirit starved of encounters with nature and sensory integration challenges are much harder to overcome. 3. 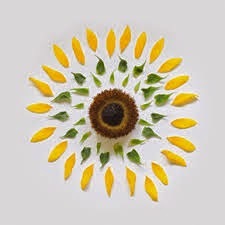 Plant seeds for edible plants and flowers. Whether it's a container garden or a plot of land, start some seeds. A mister may be best for continued watering. 4. Have a potty party! If your child is walking and isn't diaper free, it's very important to have a potty party right away. Toileting is as simple as establishing a new sense of order for where to void. Your child's sense of order, though it is not conscious, is "I pee in my diaper" just as plainly as his sense of order is "I sleep in bed." You could establish the sense of order "I sleep on the kitchen table" just as naturally as "I sleep in bed." Diapers make just about as much sense as sleeping on the dining table, but it's our cultural norm. Children under six have a VERY STRONG sense of order. It's the nature of tantrums, rigidity, and it's what allows a child to adapt to this new, strange world of his. Often, putting on underwear isn't enough to change your child's sense of order because it's too similar to a diaper. Something radical must happen so, take advantage of the warm weather and have your child go naked! Spend as much time pants free and near a potty. Have something novel and delicious to drink to increase learning moments! Over and over I have witnessed this transform a painful toileting process into an easy one! It works! 5. Pick leaves out of the yard, naming the plant. Names for a child are food for the growing spirit. 6. 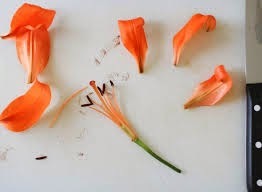 Disect a flower into it's parts and decoupage them onto a piece of paper. Here's a crazy hint. Decoupage is just 1/2 water and 1/2 Elmer's glue! 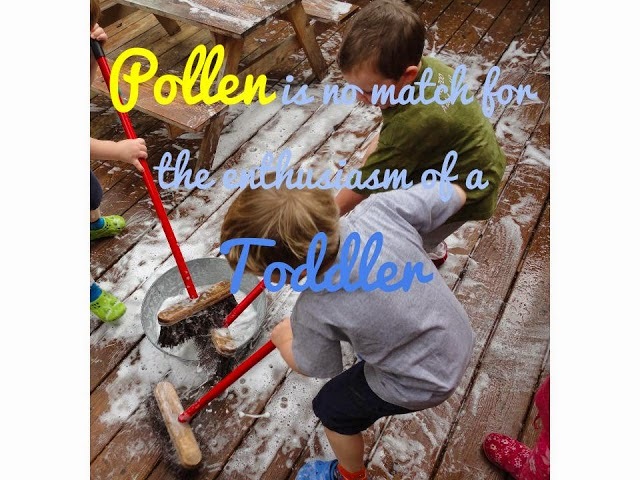 Watch the eruption of joy while your child scrubs all of the pollen off of the porch or deck! Just set up and model one time the following: a basin (add some liquid soap), a push broom, and a plastic pitcher (restaurant supply or forsmallhands.com). Model getting water 3/4 full in a pitcher and carry with two hands from an outdoor water source preferably (draw a line on the pitcher or place tape if your child needs it), pour water carefully and low down inside the basin, put the pitcher in it's place, dip the broom, lift, shake some drips with defined motions, and scrub away! Have your child rinse the basin and broom and put away the items. Set up window washing (indoors and out), leaf washing, table wiping (a tray with sponge and cloth), and indoor plant watering. You'll need to model squeezing the sponge, supporting the leaf underneath with a flat hand, and wiping carefully along the leaf with the tiny sponge. The tinier the person, the smaller the "watering can" needs to be for watering plants inside. This toddler plant watering work utilizes a coffee creamer! If your child is at least 4 1/2 years old, invite her to plan a family camp out in the yard by asking questions. This is an important mental challenge that involves planning what to eat and what to pack! When you want your child to grow up and learn how to plan, think ahead, and employ pretty much any life skill, you'll be glad you invited her to plan the family campout in the yard. What if she forgets something? It's fine! You're in the back yard. Keep repeating until she has an opportunity to become an expert at planning a campout without any help! Toddlers will love to explore a tent in the yard! 10. Set up a place outside with lovely containers for your child's collections. The containers help guide categorization, which resonates with young children because they have a strong sense of order. Think of all of the learning your child will naturally absorb just through the categorization of his own discoveries. Containers can contain categories like types of rocks, seeds (think pinecones, sweet gum fruit, maple seeds (whirly gigs), shells, sticks, dry flowers, leaves, feathers, nests and even dead bugs! Need extensions? Set up an exploration of sink and float. Note the word explore, not "teach"! Magnetic and non-magnetic is a fun exploration, too. This is only the beginning of nature exploration! If there was anything that is closest to a Montessori classroom environment, it's nature! Nature is a laboratory for mathematics, biology, physics, geology and a gymnasium for the spirit, mind, body and senses. Your child is a natural observer, with powers of observation we no longer possess as adults. Our fixed minds have filters to process the world, but the developing minds of children can absorb the patterns of nature through every sense exactly as it is. Here, your child is the expert, the scientist, the connoisseur. Our soul's can grow a little bit each time we experience nature through the eyes of the child.